Making homemade body butter is getting pretty popular these days, so I decided it was about time that I try making one of my own. I love making homemade beauty products like this because I can control exactly what goes in them and customize them the way I want to. I also like the fact that the ingredients are so simple and that I can have a natural moisturizer with just two or three ingredients instead of the 15-20 that you usually see in store bought moisturizers. Coconut oil is an ingredient that shows up all of the time in DIY beauty products because it’s a very effective moisturizer and it also has anti-bacterial and anti-fungal properties. Tamanu oil is a lesser-known tropical oil that is great for helping to repair damaged skin and for giving the skin a more even tone and texture. Since it is more expensive than coconut oil and since it doesn’t absorb as well by itself, it’s a great oil to mix with the coconut oil. That way, you can make the pricier tamanu oil last longer and you can have a moisturizer that absorbs into your skin more quickly while still having the benefits of both oils. For awhile, I tried using just plain coconut oil as a moisturizer. It worked great for a while, but then the cold weather came and I ended up with a rock-solid jar of coconut oil that was anything but spreadable. I was getting really tired of trying to dig the rock-solid oil out with a spoon, so after finding this whipped coconut oil body butter recipe by The Nourished Life, I immediately took out my mixer and made a batch. Then when that was all gone, I decided to try making a version that used some of my tamanu oil too and added in some bergamot essential oil. I ended up with a really smooth, citrus-scented body butter that stays soft and spreadable even on days like today when freezing cold outside. * The coconut oil I linked to above is the one that I like the best because it has a neutral smell and flavor, so it’s more multi-purpose, and I can use it for times when I don’t want something to taste or smell like coconut. 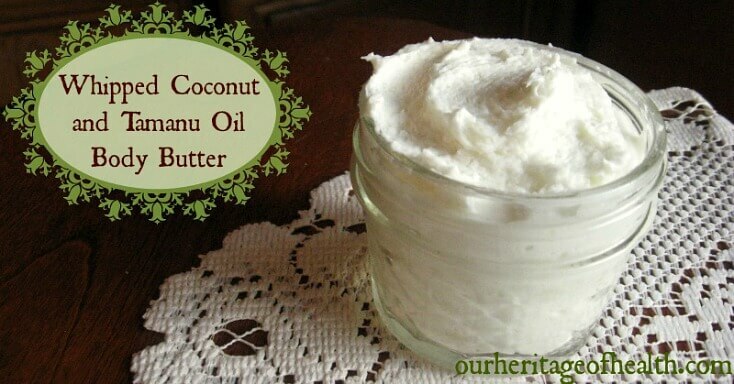 If you want a coconut smell to your body butter, though, an unrefined virgin coconut oil would be a better choice. Mix for about 5 minutes or until the oils are light and fluffy. I used a low speed, but the mixer I was using was very old, so for a newer mixer the settings might be different. Store the finished body butter in a glass jar. I like using these little mini Mason jars . For most of the year, you can just leave this at room temperature, but for the summer months or if you live in a very warm climate, you might want to keep it in the fridge so the coconut oil doesn’t melt in the heat. Important Note: If you decide to use bergamot essential oil or any of the other citrus oils like lemon or orange, you’ll need to make sure you avoid direct sun exposure for at least 12 hours afterward because these oils can make your skin more sensitive to the sun and more likely to burn. If you’re making this during the winter when it’s too cold to be out in the sun anyways, you probably won’t even have to worry about it, but if it’s summer and you use citrus essential oils, you wouldn’t want to use this right before going to the beach or spending the day outside. Is this good for tanning? does it provide any sunscreen protection? I’m glad you mentioned this. I actually need to update this post, because I forgot to mention that if you decide to use bergamot essential oil (or any of the other citrus oils) for fragrance, it’s best to avoid the sun directly after because those oils can make the skin more sensitive to the sun and more likely to burn. If you use other essential oils, though, or if you choose not to use any at all, then yes, this would be fine to use before going on in the sun. It might provide some slight sunscreen protection from the coconut oil, but only a little bit. If you’re going to be out in the sun for any length of time, I would recommend using sunscreen. PS why do you recommend keeping in glass? If you’re using any essential oils for fragrance, it’s best to store them in glass because they could cause chemicals to leach out of the plastic. Does this need a stabilizer and what stabilizer would you recommend? This recipe doesn’t need a stabilizer. It should keep quite well at room temperature for several weeks or even months. I’ve always found that when I make small batches like this, I use the all up before they ever have a chance to even get close to going bad. What could be added to this recipe as a sunscreen? I’ve never tried adding anything to this recipe to turn it into a sunscreen, but if you have a source of zinc oxide, you could add that as a natural sunscreen. I would recommend finding a recipe that’s specifically designed to be a sunscreen recipe, though, to make sure you’re using the right amount and mixing it properly. Zinc oxide is a natural sunscreen, but it does give that white pasty look that’s hard to completely rub in. I personally find, though, that it’s easier to just buy a natural sunscreen from a health food store on online since I only use sunscreen a few times a year at the beach. Pingback: Every DIY Lotion Recipe You Need - 50 Recipes! 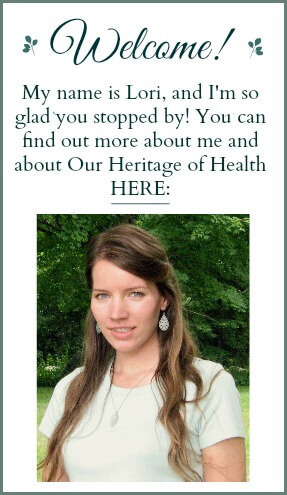 I love to use homemade recipes for taking best care of my skin. 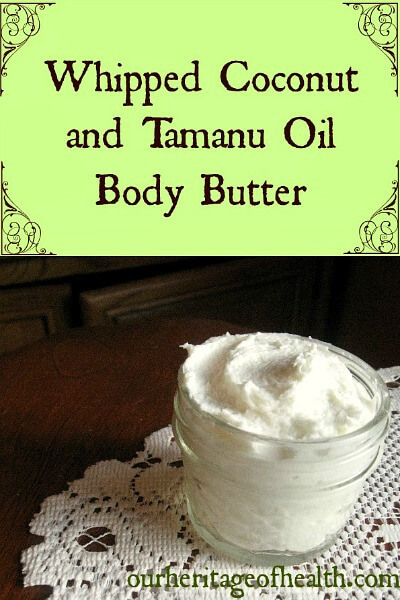 This body butter seems easy to create. I can’t wait to try this. Thanks for sharing.